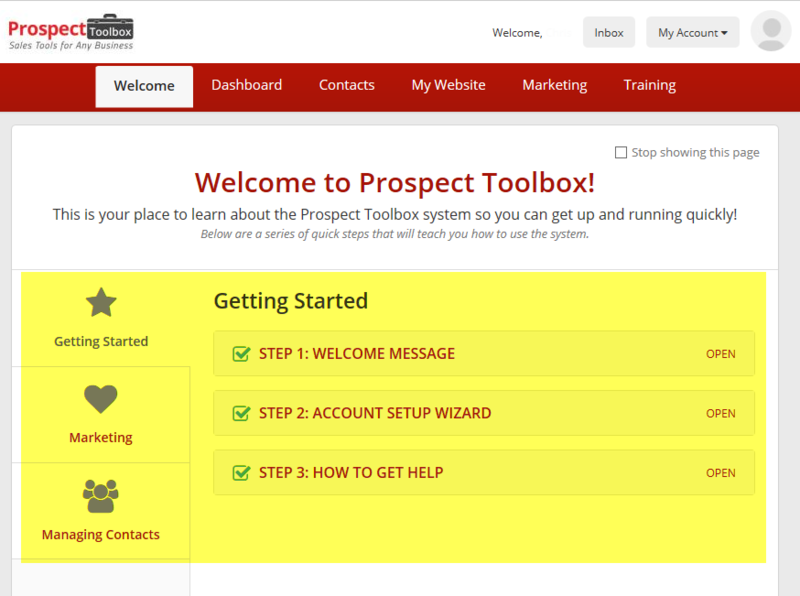 Congratulations on your new Prospect Toolbox System! We suggest that you use your first 10 days of your $1 trial to create your perfect dream system. The primary reason we offer a $1 for 10 Day Trial, is to give you time to set up your system before you pay full price and start contacting leads using the system. We know this may seem like a lot to do, however, you likely only need to do this one time. Remember, you are creating an automated machine to do a lot of the work for you! However, just like hiring and training a personal assistant, you need to tell the system how you want it to work for you. Before you know it you will be quickly contacting hundreds of leads and enjoying a system that is sending out personalized company videos, follow up emails, and so much more! We’ve already added a lot of content for you, now it’s your turn to add your personal touch to all of it. 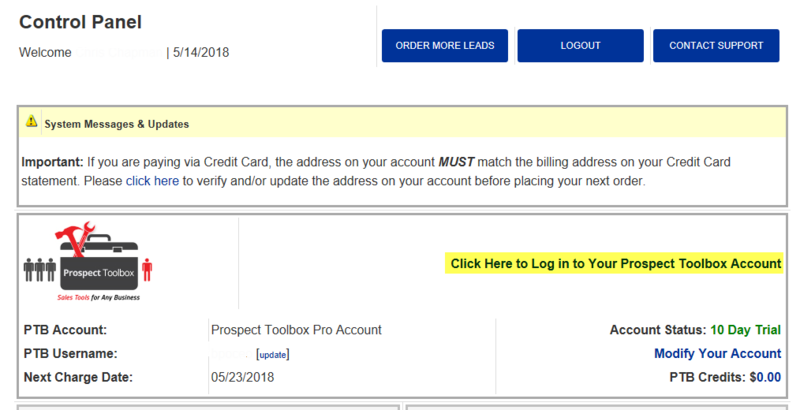 The Prospect Toolbox is highly customizable, and the more you make the system personal about your business, with your stories, videos, etc., the better your results will be. Click here to login to your HBBLeads account, then login to your Prospect Toolbox account. You only need to log in one time at HBBLeads to access both accounts! If you have not done this yet, you may see a link to “Click to Activate” before this step. In this control panel, you can upgrade, downgrade, cancel, view your next billing date, update your credit card, and change many other settings, at any time. At the minimum finish the Getting Started steps 1-3. 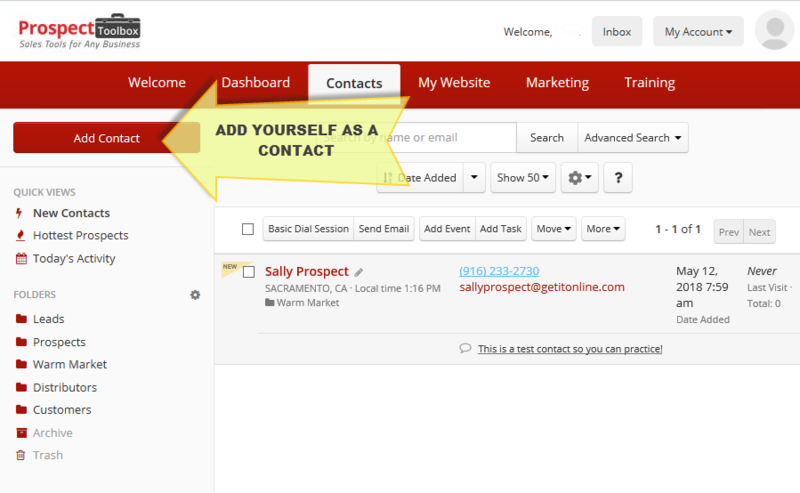 You can revisit the Marketing and Managing Contacts tabs at a later time. Click here to use a custom domain. Although this setting is optional it is highly recommended for the best results. You can use a domain name you already own or buy one through the system (about $12.99 / year). When you use your own domain name, your marketing website, lead capture pages, smart sender, and email address will be professionally branded to YOU! Also, this is the #1 way to get more emails landing in the inbox because you will not be using the same domain name as other users on our system. To learn more about email marketing watch our training videos. Please keep in mind that you can add a custom domain later at any time, however, you cannot remove or change it in the future or you risk breaking links, missing reply emails, and much more. After you add your domain successfully, it is recommended to go through the Getting Started wizard again one more time to create your new email address with your new domain. Take your time to go through each link on this page. You may not need to change anything, however, will have peace of mind that you know what information about you is being shown in the email campaigns and where to change settings in the future. If you added a domain name in the previous step, you will need to check all of your account settings again to make sure your new email address is being used and displayed correctly. 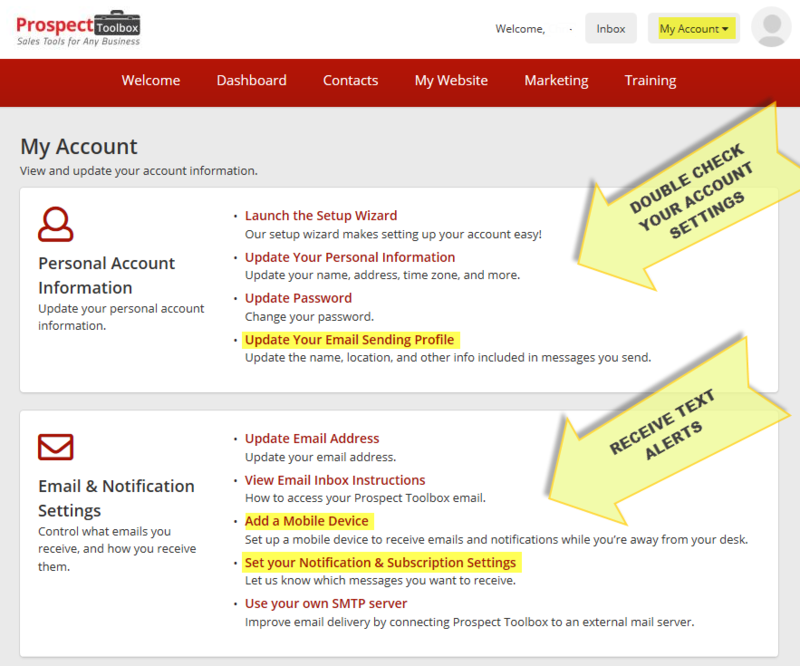 Prospect Toolbox not only sends marketing emails, it also has a personal email account. This is where you will receive all of the replies to your email autoresponder and more. 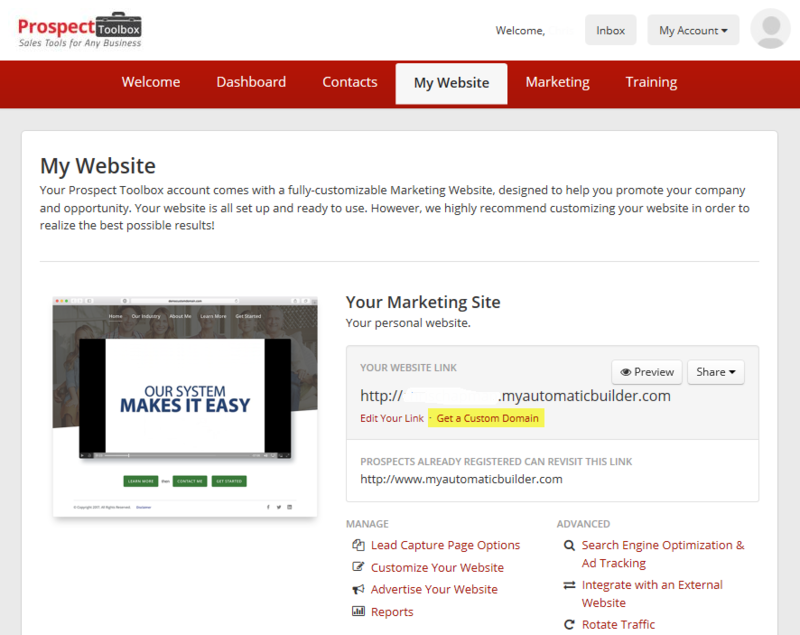 Be sure to check this every day when you start to receive leads in your system! 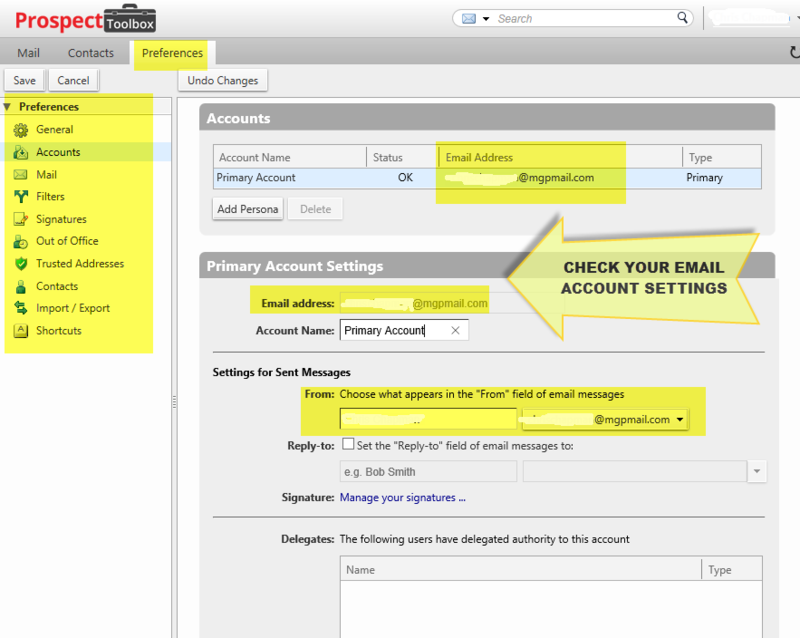 Follow the images below to learn how to find your personal email account, and change the settings to work exactly the way you want it to. Click here to add your own videos. 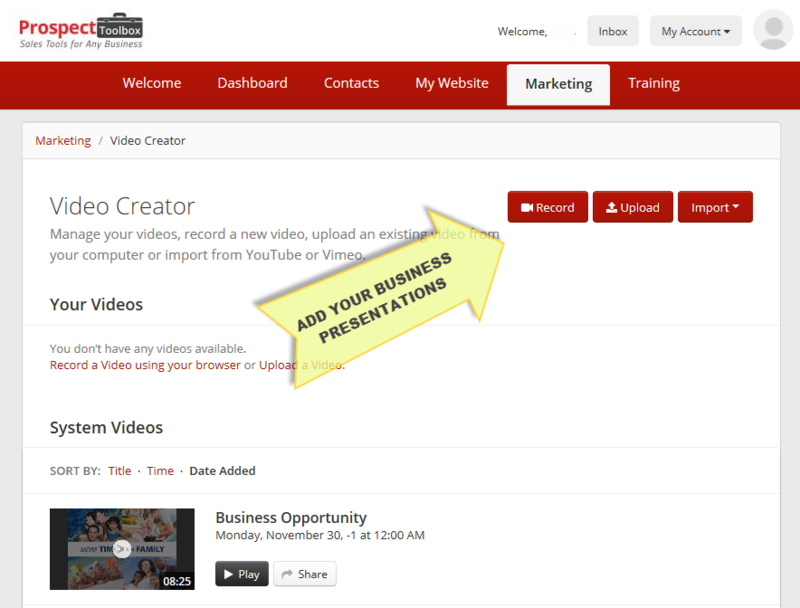 You will need to add videos here BEFORE they can be added to your E-mail Campaigns, Marketing Website, Lead Capture Pages, Smart Sender, and more. Use the “Import” button to instantly add videos from YouTube and Vimeo! This is the easiest way to add them. You can always add more videos at a later time. If you find you are sending the same video frequently, be sure to add it here and then add it to other marketing tools such as an email campaign! 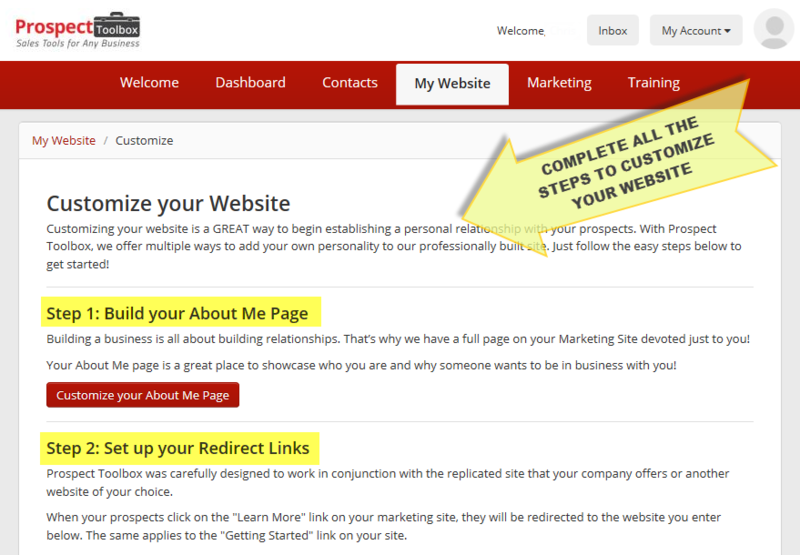 Click here to customize your website. Your marketing website is a video presentation website featured in many of the email campaigns that will be sent to your leads. Be sure that “Step 2” on this page links directly to your personal company sign-up, checkout, or enrollment page for your home business so that you have the possibility of getting sign ups! Add your personal information as a contact to test out the tools! This is the best way to see how the system works. Note: Do not send yourself systems emails repeatedly or you will get blocked as a spammer. Marketing emails can take 0-4 hours to reach your inbox, learn more about this in our Email Secrets 2 course. Please contact us if you need help with any of the steps above. Did this post help you? What training do you want to see next? My up-line,, thanks a lot for the article post.Much thanks again. Fantastic.